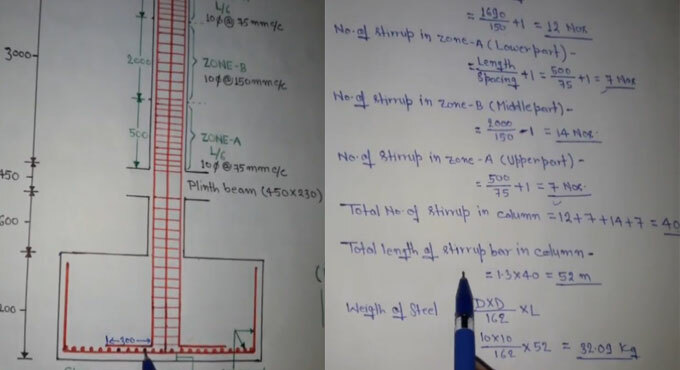 In this construction video tutorial, you will learn how to find out bar bending schedule (BBS) of a concrete column up to 1st floor. The column reinforcement bars are built up from the Footing. The topmost column reinforcement bars are fastened at the laps and joined. Here, monitor the lap lengths carefully. Once the main reinforcement is formed, cover blocks are connected to column reinforcements to retain the necessary cover for column reinforcement. Most of Columns centers are situated at the junctions of grid lines. Column stirrups are secured up to beam bottom level and rest is tightened as soon as the beam reinforcement is fabricated. Therefore, proper instruction is given to the bar benders to arrange the stirrups. Use a chalk to mark the stirrup spacing from the basement floor level in the Column main bars by adhering to the detail drawing. To know the detail process, watch the following construction video.